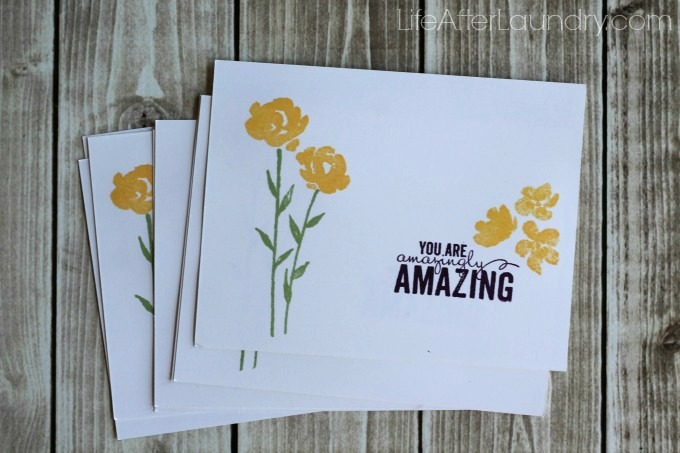 Thank you to Stampin’ Up for the supplies to create these 7 Amazingly Easy Cards, the perfect card to brighten someone’s day! 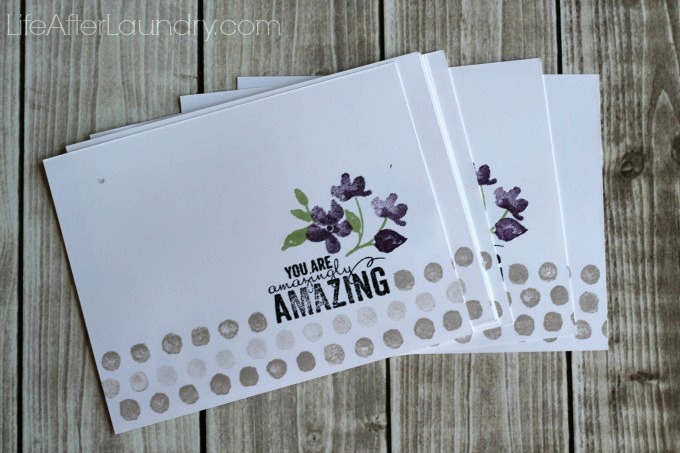 Of course, your options are endless with this Painted Petals Stamp Set, but I was able to whip these 7 up very quickly! This week I have been working on some cards for the wonderful ladies of our church. 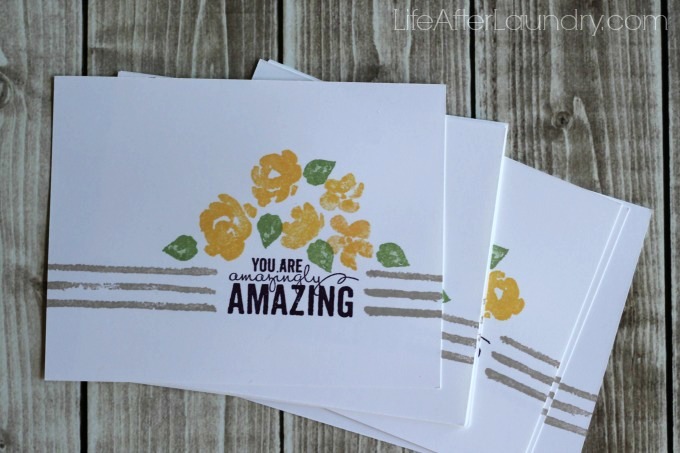 With these gloomy winter days we can all use something bright and springy to cheer up our day, which is why I decided to use the Painted Petals stamp set by Stampin’ Up! I needed the cards to be thoughtful, but some what easy to put together since I had 40 to make. I know it is easy to get caught up in adding all sorts of elements to a card, but I really forced myself to only use the stamps to be most efficient with my time. 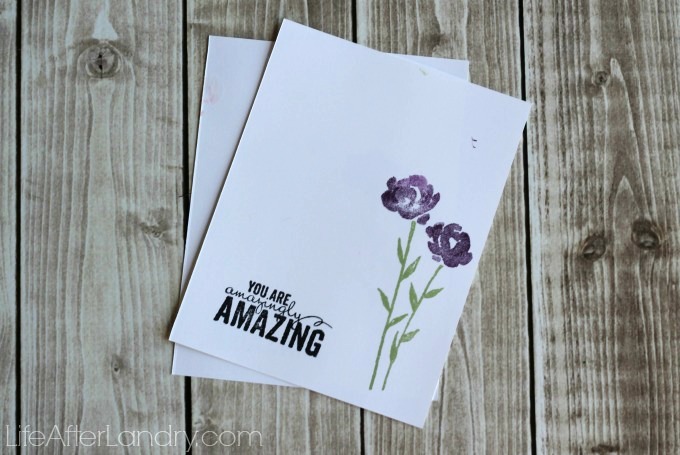 I used the photopolymer Painted Petals stamp set, so it was very easy to layer my designs. Most of the cards are using the same stamps, but just different combinations. Even though the cards are simple, I don’t think they ended up looking plain. If that makes sense, I don’t think they look like they are missing something even though there is a lot of white space. I think it just fits with the card. Since I needed so many cards I ended up cutting a card in half to make more of a postcard or note card for each one. I wish I had this awesome postcard stamp, but since I don’t I will just slide each card into an envelope. I made several on each card above, but the two below are my 2 unique cards. They are unique because I actually messed up something about each of the cards, and instead of throwing them away I decided to add to them to cover it up. I’m still pretty new at cardmaking, so I make mistakes. I think the one card, I made 3 mistakes. The thing is they ended up being my favorite cards! I’m so proud of how they turned out and even though they were my mess ups I think they turned out beautiful. 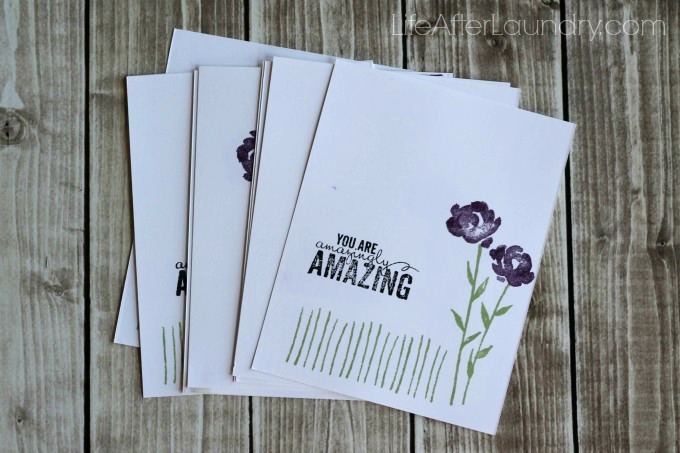 It was a huge confidence booster in my cardmaking skills to work around a mistake. It doesn’t seem so scary now to create my own cards now, and I’m not afraid of messing them up. The easy part is done, making the cards, now I have to write a note in all of them! 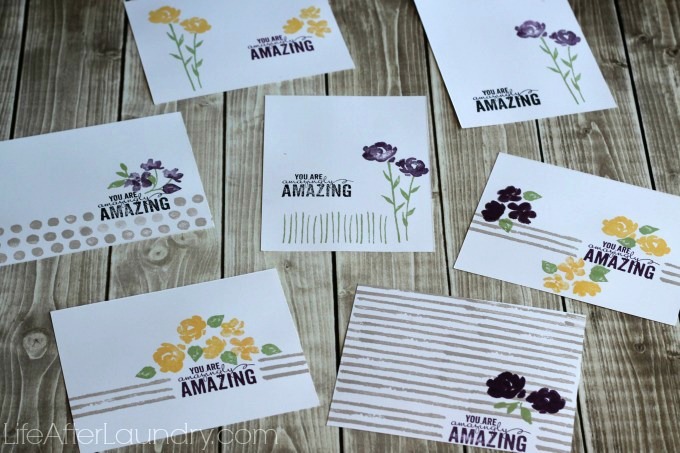 A few of the tools I used were the Stampin’ Trimmer, Clear Block Starter Bundle, Stampin’ Mist and Stampin’ Scrub. 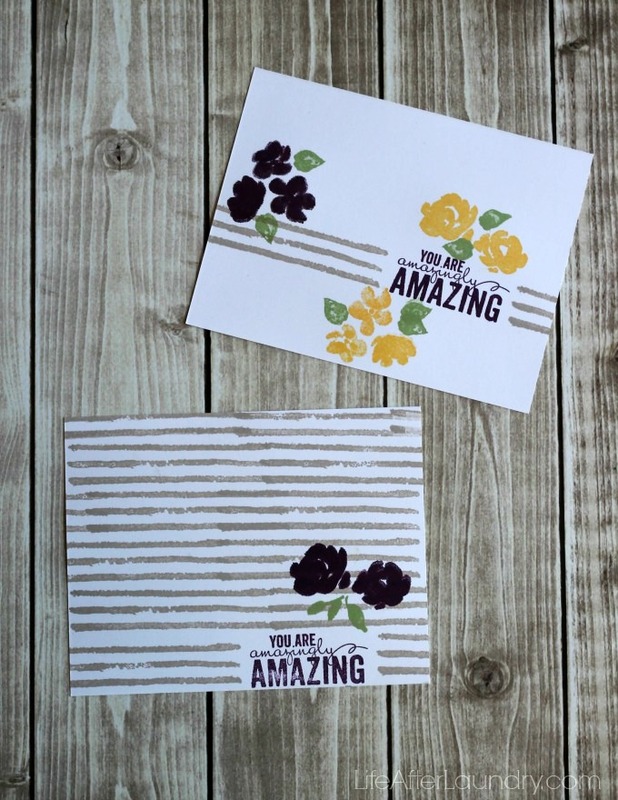 Now, during SALE- A- BRATION is a great time to stock up on your Stampin’ Up! supplies because for every $50 you spend you earn free products! I was able to to score The Best Day Ever Stamp Set free with my last order. If you love these cards you could easily purchase the products I have listed to earn your free stuff. They turned out so pretty. Very nice job. These are so cute. Nice job.